We have a ceiling fan and light fixture that’s slowly grown dimmer as each of its three light bulbs burned out. The first time, I grabbed a new LED bulb out of the closet, unscrewed the lamp, and removed the burned-out bulb — only to find a light bulb with two prongs at the bottom, instead of a normal screw-in bulb. When the second bulb burned out, I remembered that we still didn’t have any two-pin bulbs in the house, and just accepted the fact that we’d need to use a desk lamp in that room until I picked up a couple of replacements at Home Depot. 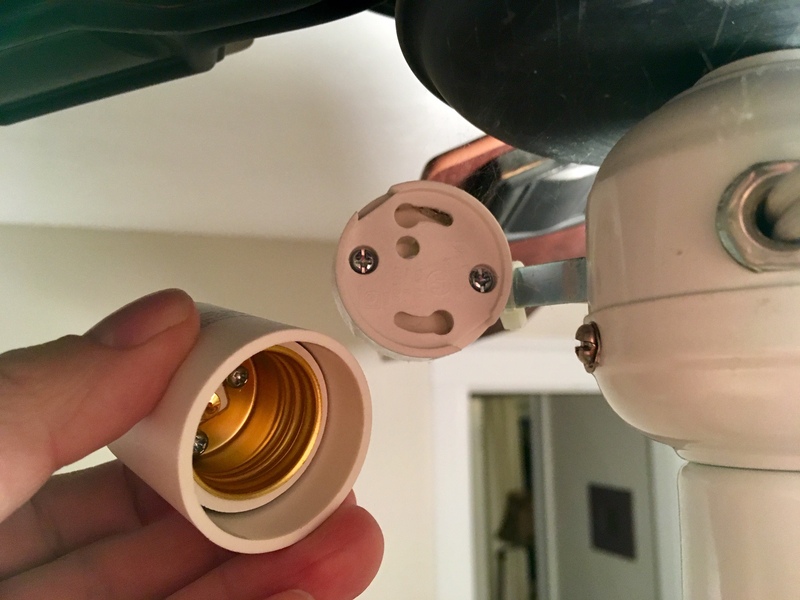 By this time, another fixture had a bulb blow out — this one in the pantry — and it too required a two-prong light bulb (called a GU24 bulb). Naturally, despite my best intentions, I never did buy any of those two prong bulbs. I looked (okay, I glanced) but I didn’t find any on the shelves at Home Depot. And finally, the third bulb in our ceiling fan blew last week, so it was utter darkness in the room and time to take action. Lo and behold, in finally searching Amazon for replacement two prong bulbs, I found a magic little gadget instead: this GU24-E27 adapter. 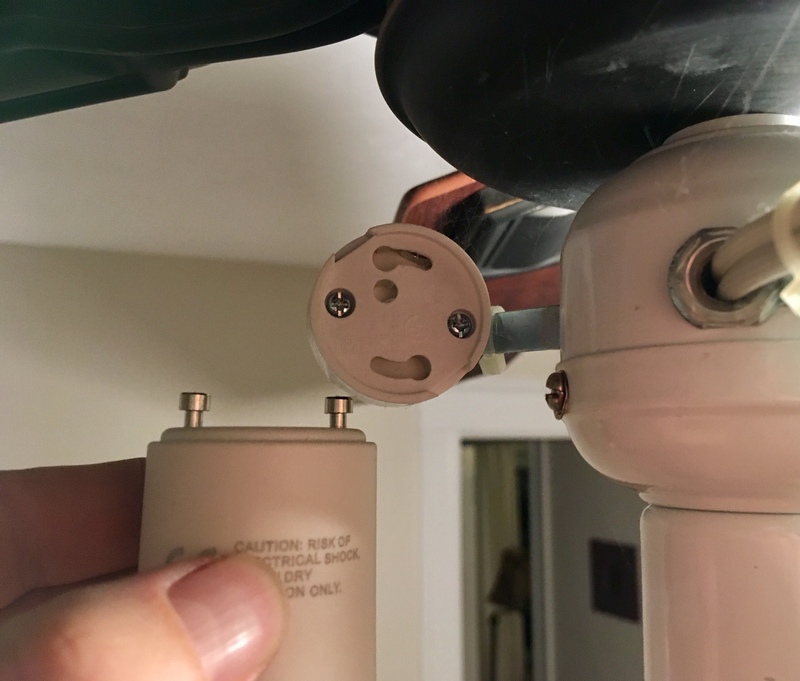 For under two bucks, this thing fits a two-pronged GU24 socket, but allows you to screw in a regular light bulb (E27 is the standard size) — which, of course, are in plentiful supply at both Home Depot and my linen closet. Problem solved! 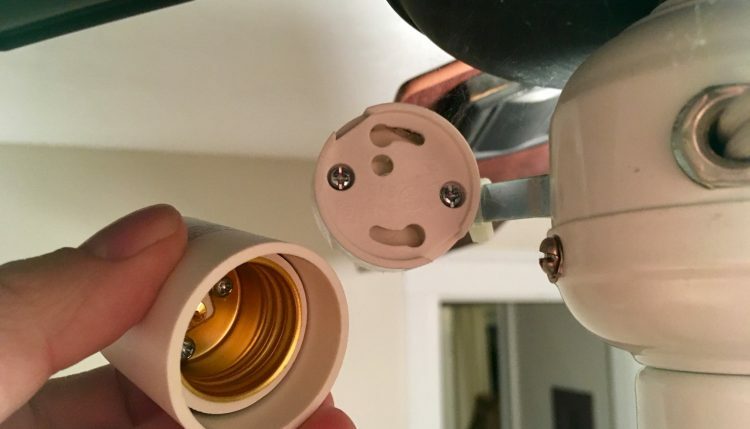 The adapter adds about half an inch in length, but there was still enough room for three of them and three standard LED light bulbs inside the glass bowl of our ceiling fan’s light fixture. One note: A fixture designed for a two prong light bulb is not meant to handle a high-wattage incandescent bulb. Only use a GU24 adapter with a low-watt, high efficiency LED or CFL bulb.